Crabbing near Bainbridge Island in Puget Sound, Washington. 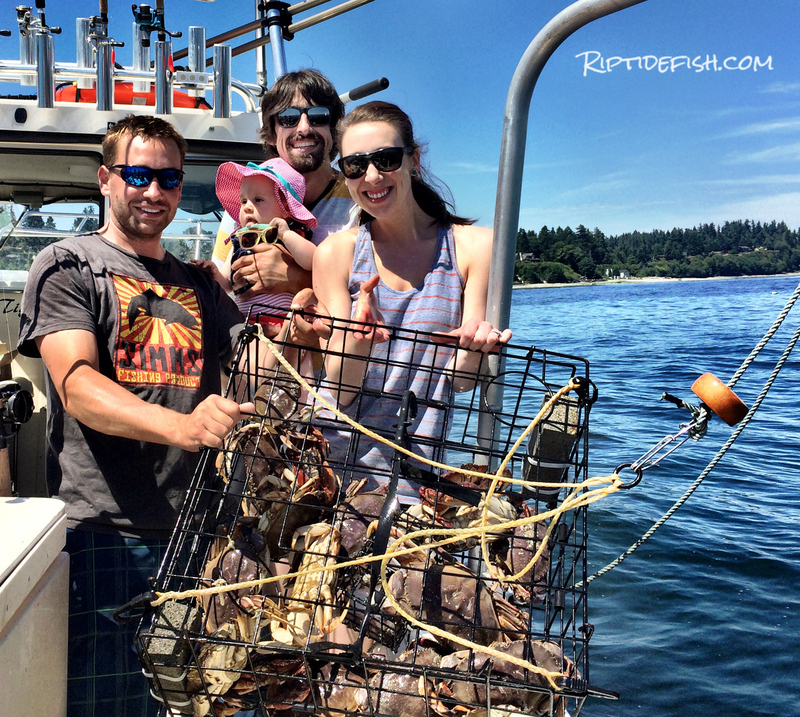 Summer wouldn’t be the same in Puget Sound without going crabbing for Dungeness! Puget Sound is a summer paradise and Dungeness Crab are arguably the most sought after bounty. Small boats work the nearshore waters, the baiting and setting and pulling of pots all for a payout of big hard shell crab. Dungeness Crab are one of the tastiest shellfish that we find in Puget Sound. They are so delicious that about a quarter million crabbing licenses are sold in Puget Sound every year. Dungeness Crab have deliciously sweet meat and are found throughout Puget Sound. They can reach 8 inches and weigh a hefty two pounds. They prefer a habitat of eelgrass beds, sandy or gravel sea floor, and typically live in waters less than 150 feet in depth. Catching Dungeness Crab is a fairly straight-forward endeavor. Crabbing doesn’t require expensive equipment or a large boat. You can head out in a protected area in a kayak or stand up paddle board if you want! Use whatever vessel you have! 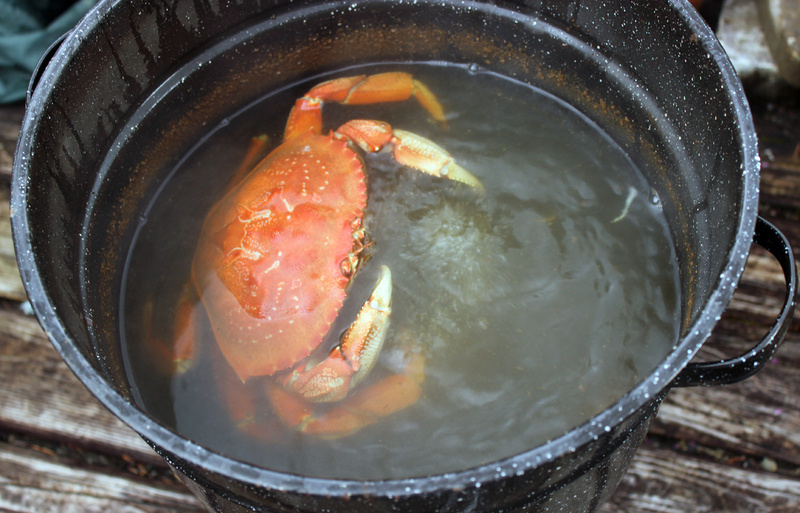 It is as simple as picking a spot, dropping a crab pot or two, letting it soak for a few hours. 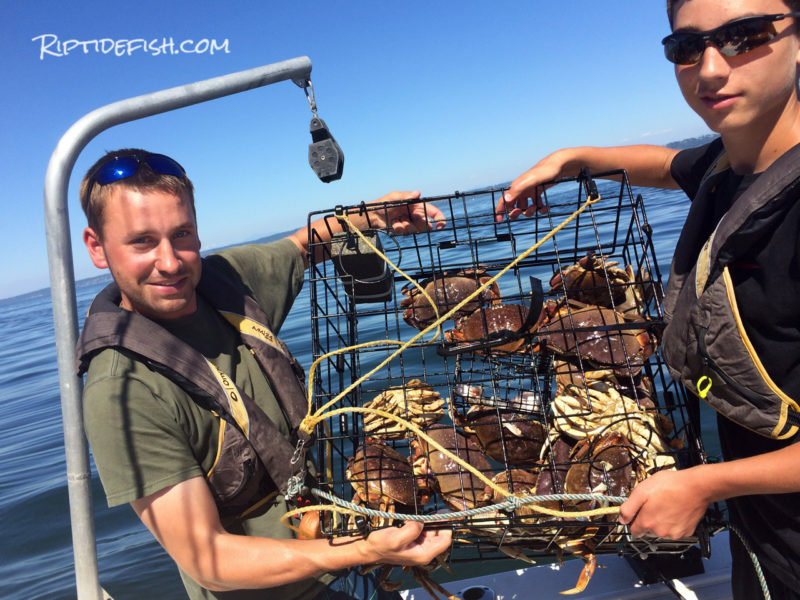 The anticipation of pulling up a crab pot and seeing it loaded with Dungeness is exciting! The meal that follows is even better. Dungeness Crab populations in Puget Sound are cyclical. This means that some years in some areas your pots will be loaded. Other years can be challenging to catch a couple keepers for the day. Being super prepared is always the best strategy. Use good bait, don’t get set your expectations too high but don’t be surprised if you catch enough keepers that you need to throw a few back. 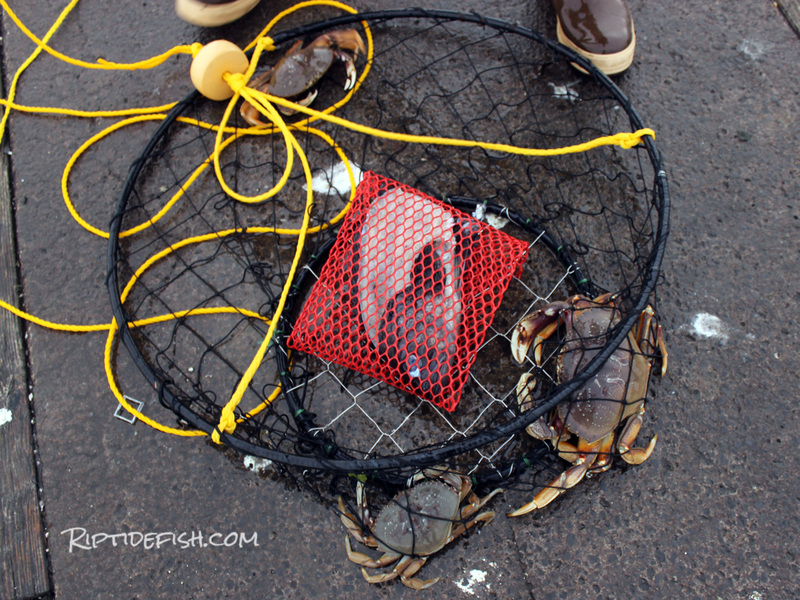 Puget Sound Dungeness Crab are easy to catch! Catching Dungeness Crab in Puget Sound is a fairly simple task. The majority of folks who target Dungeness utilize boats. Catching crab from shore or pier is possible, but boating greatly increases your chances. What do I need to catch Dungeness Crab in Puget Sound? If you are trying to find an easy activity that will provide an incredible seafood meal, you have to get into crabbing. You can get started with a pot, line, buoy, bait cage and bait for less than $30 each. There are a few key items needed to catch Dungeness Crab. Friends to help you work gear and share the bounty with! Piles of fresh caught Puget Sound Dungeness Crab. First, you need to familiarize yourself with the area you will be working. By looking at a chart, one can decipher roughly how deep to set pots. You always want the amount of line to be greater than the depth you are setting pots. So if you know you are only going to be dropping pots in 40′ to 50′ of water, then 75′ of line will be fine. Realize that the tide can rise by at least 10′ at times, so having extra line will keep your pots from drifting away or your buoys from sinking below the surface. I go to different areas and usually drop pots in 40′ to 100′ so having 120′ of line is perfect for me. Protected bays have less current but you still need to make sure your pot weighs at least 10 pounds to be safe. If you are crabbing in areas with heavy currents, focus on short soaks around the tide change or have your pots heavily weighted. Soaking times for pots and traps can vary from an hour to overnight. Crab can find their way out of a pot, but as long as there is some bait left to feed on they will stay. Make sure to use plenty of bait for an overnight soak. If you are using rings that lay flat on the bottom, then crab only need to tap-dance over the ring to the bait, and a 15 minute to 45 minute soak is more than enough. We always drop a few crab pots on our way out salmon fishing in Puget Sound. Crabbing is a summer time tradition that is enjoyed by so many people. If you haven’t been crabbing here, then you haven’t come even close to locking in your Don’t Hassle Me I’m Local status, and if you are visiting it is an experience that is unique to the Pacific Northwest. The Puget Sound is a complex place with islands, inlets, bays and fjords. It has 1,330 miles of shoreline, not including the San Juan Islands! Dungeness Crab are the most prominent shellfish that we harvest for food and can be found in countless locations around Puget Sound. 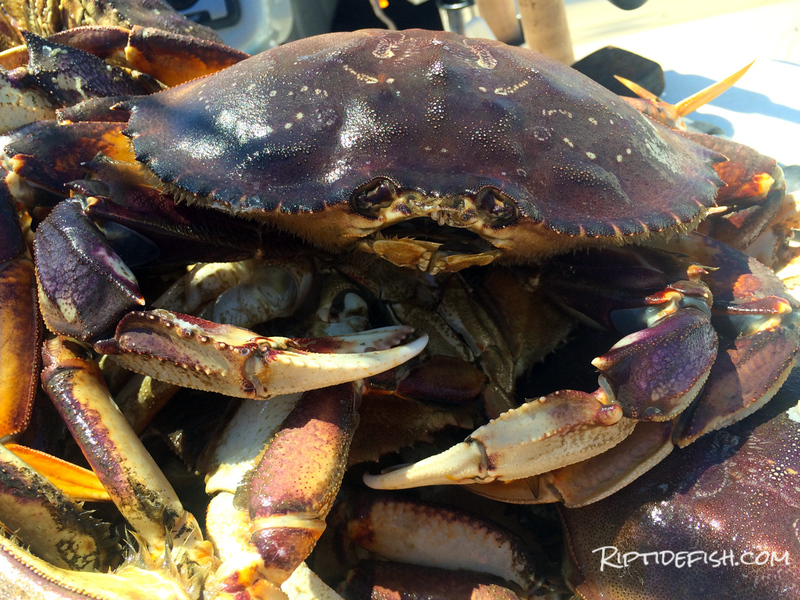 Dungeness Crab thrive in areas from the tide mark down to 150 feet. They prefer a sandy bottom and in the extreme shallows (waters less than 30 feet) they love eelgrass beds. I focus on areas that have a gradual slope. Protected bays can be good. Wherever there is a stream or river mouth can be good. Don’t get too caught up in the hot crabbing spot that you read about because there are so many areas that will yield good crabbing. That being said I did want to list some well known spots in each area that will give you a great starting point if you are new to crabbing. Always measure your crab to ensure you are only keeping legal size Dungeness. North Puget Sound offers great crabbing in the shallow expanses of its largest estuaries. Padilla Bay, Skagit Bay and Birch Bay are great places to catch Dungeness Crab in less than 50 feet of water. The North Sound features large eelgrass beds which are the preferred habitat for Dungeness Crab. 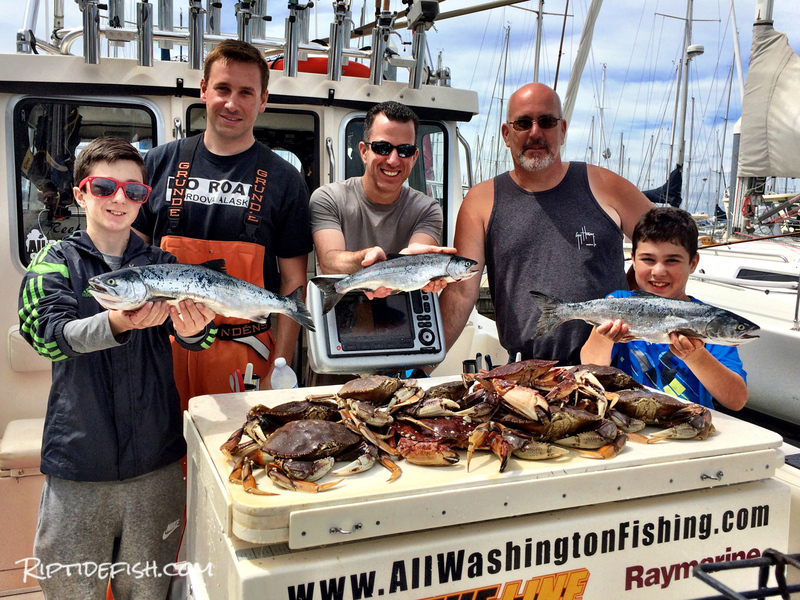 Puget Sound Dungeness Crab Season Click Here! Freshly caught Dungeness Crab from Puget Sound, Washington. Whidbey Island protects the waters to the east from major summer weather and everything to the east offers relaxing crabbing conditions on most summer days. This is considered Marine Area 8-1 and 8-2. Summer homes and cabins fill the shorelines of east Whidbey, Camano Island. Pugetropolis cities of Everett and Mukilteo fill up the mainland. Crabbing here is a popular summer pass time. Puget Sound Dungeness Crab Season Click Here! My mom’s first time crabbing in years! Crabbing near Camano Island, Washington. 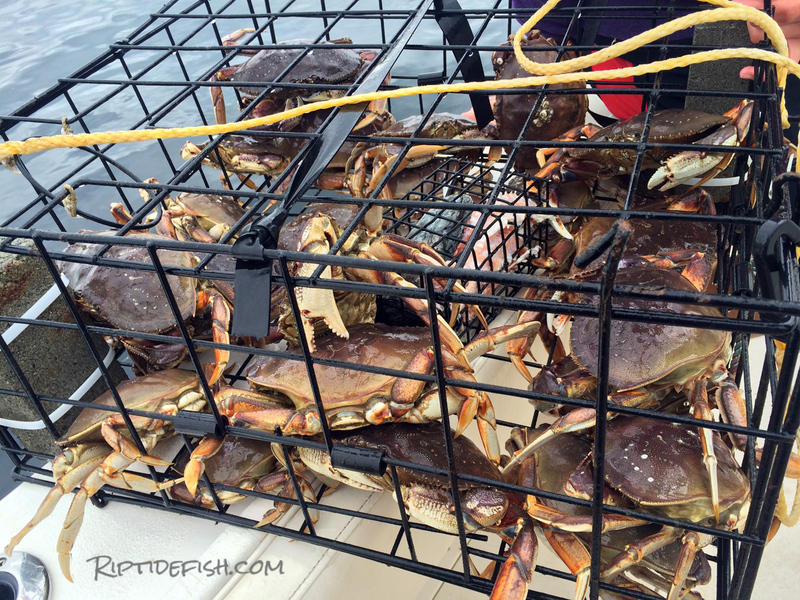 Crabbing can be good in Admiralty Inlet, which is the area between Port Townsend and Edmonds. There is a mix of steep drop offs and shallow flats in this area. I like finding a spot that offers protection from the strong currents. It can get pretty busy here. 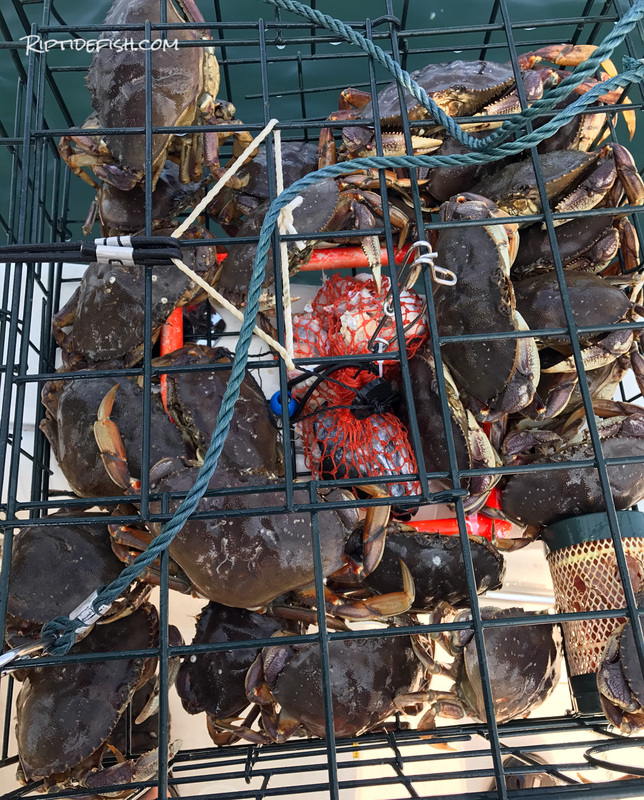 Even though there are a lot of people that enjoy crabbing boats, it can offer up limits of Dungeness Crab or at least a few nice crab that will make a meal for the evening. Puget Sound Dungeness Crab Season Click Here! 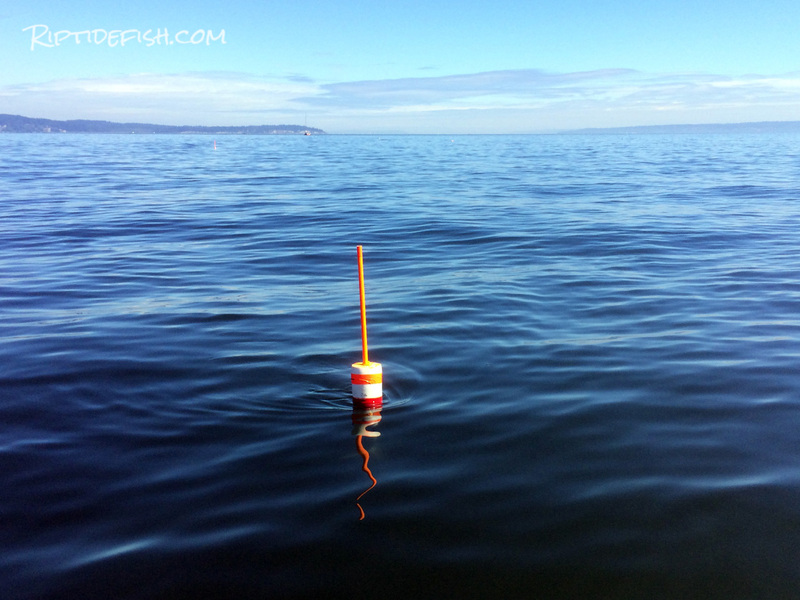 There are many great places to soak a crab pot in Marine Area 9 near Edmonds. 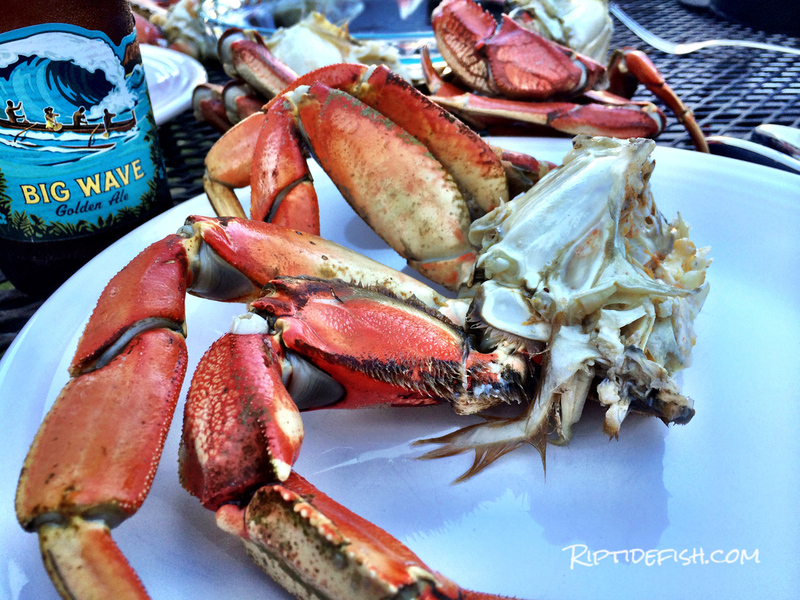 Believe it or not, there are good Dungeness Crab spots near Seattle. The waters near the Seattle neighborhoods of Ballard, Magnolia and West Seattle can yield a delicious Dungeness Crab meal during summer months. It is fairly common to see people in kayaks, small boats and even stand up paddle boards paddling out with a crab pot or two! 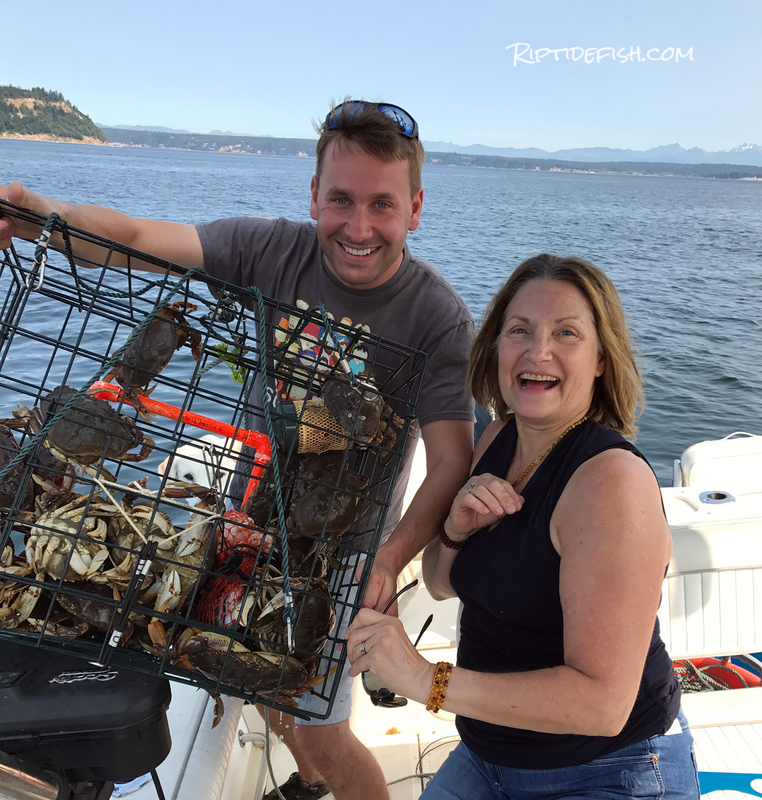 Puget Sound Dungeness Crab Season Click Here! Catching Dungeness off Bainbridge Island sure was easy that year! South Puget Sound features an expansive shoreline with many islands, inlets and bays. This region is defined as Marine Area 11 which is the waters that surround Vashon Island south to the Tacoma Narrows Bridge and all the waters south of the bridge is considered Marine Area 13. Unfortunately Marine Areas 11 and 13 will not open for crabbing in 2018 due to low abundance. Puget Sound Dungeness Crab Season Click Here! Sometimes one pot will hold a couple limits of keeper-sized Dungeness Crab! Hood Canal offers some of the most scenic Dungeness Crabbing in the greater Puget Sound region. Anywhere along the Canal shoreline in the 35 feet to 80 feet range can offer great crabbing. 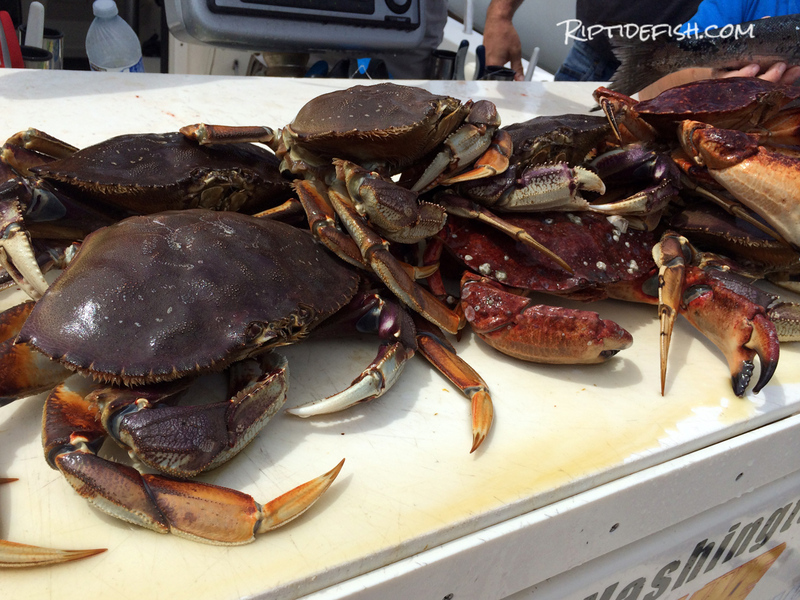 Puget Sound Dungeness Crab Season Click Here! It is important to understand the fishing regulations for Puget Sound. Check out WDFW Frequently Asked Crabbing Questions. Currently, the daily limit is 5 Male Dungeness Crab per person with a minimum size limit of 6 ¼ inches. 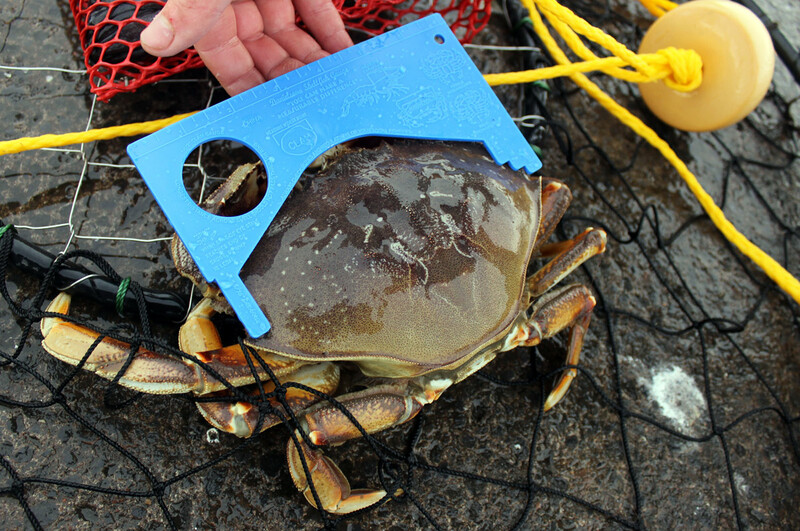 Always carry a crab measurement device and keep only Dungeness that are larger than the minimum. 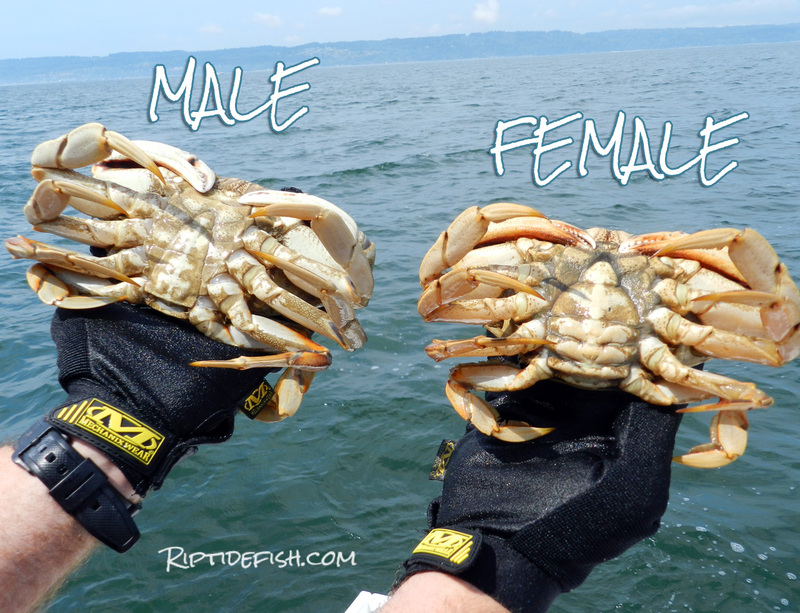 Dungeness Crab molt throughout the Spring & Summer, and any molting soft-shell Dungeness has to be released. To determine whether a Dungeness is hard-shell or soft-shell squeeze the back leg or the underside of the carapace, if it flexes with ease, throw it back. There are specific openings each week, and being aware what days are open and what hours are open is important. Soaking crab pots overnight can be very productive, but there might be rules as to when you can set and pull your pots. 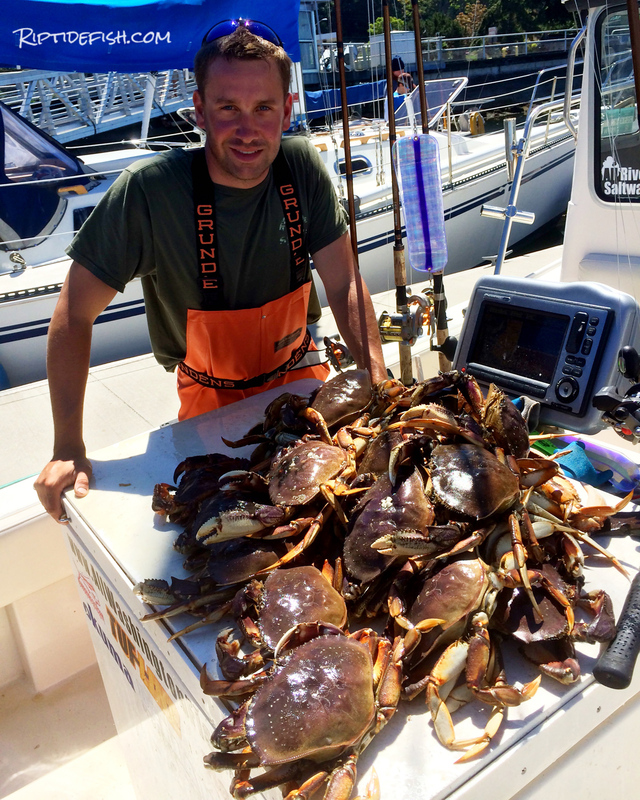 Puget Sound Dungeness Crab Season Click Here! The underside pattern of a Dungeness will tell you whether it is a male or female. Dungeness Crab need to be cared for from the moment they are pulled from the water to the time they are cooked. Cooking Dungeness Crab in easy! The goal is to keep the crab alive until it is time to cook them. This is important. Placing the live crab you keep into a boat live well with recirculating sea water while you are out crabbing is the best. This keeps them alive in the cool sea water that they just were pulled out of. If you don’t have a live well, then a cooler with ice will be a great place for the crab. They will keep alive and go into a dormant state. Just be sure that the crab don’t drown in the meltwater! I always cook my Dungeness the day it is caught. Boiling crab is the most popular way to cook them. Share your crabbing tips and ask questions below!